Your pets don't like fireworks as much as the rest of the family. What can you do to help? How To Make Your Cat's Vet Visit as Stress-Free As Possible! Should You Consider Pet Insurance For Your New Puppy or Kitten? This Summer, Guard Your Garbage Cans! Congratulations On Your New Kitten! 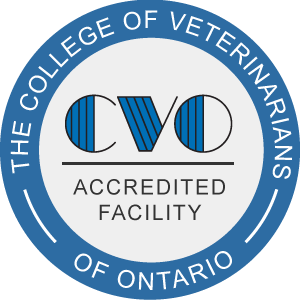 If you live in beautiful Gananoque or the surrounding Thousand Islands area -from west of Kingston to east of Lansdowne and Brockville- and you need a veterinarian to care for your pets, look no further. Dr. Brian Willows, Dr. Scott Stevenson and their professional staff (Tracy, Judy, Sonia. Stephanie, Karen, Jessica, Cassey and Donna) are here to tend to your pet's health care needs. Effective April 15, 2015 TIVS underwent a shift from all species (mixed practice) to now 100% of our focus being on your family pets. “We understand the loving bond which exists between you and your family pet and we take every possible measure to give your animal(s) the health care that they deserve to help to strengthen and lengthen that bond. We respect the trust that you place in your veterinarian, and we always strive to give our very best to you and your beloved pets”. We also understand that the experience of coming to the vet clinic can make some pets nervous. We are striving to change that! We want all of our clients and their pets to feel as at ease as possible when they come in for an exam. We employ many different techniques to further this goal and we can give you tips and ideas of things that you can do at home to make your visit to the vet clinic as stress free as possible for you and your pets. Thousand Islands Veterinary Services is a full service animal hospital and welcomes both “in hours” emergency treatment cases as well as pet patients in need of routine medical, surgical, and dental care. Dr. Brian Willows has over 30 years of experience offering regular pet wellness care, as well as diagnosing and treating serious medical conditions when they arise. Dr. Stevenson also shares the clinic values of providing the best possible medical care for our patients as well as making sure that their owners are fully educated and engaged in all aspects of their beloved pet’s care. Providing exceptional customer service and client education are core values that all members of the TIVS team strive for. Dr Brian Willows, Dr. Scott Stevenson and the TIVS staff are also very excited to report the completion of an extensive clinic makeover. The goal of this makeover has been to limit fear and provide a comfortable and calm environment for both clients and pets. This renovation along with their experienced and friendly staff will provide your pet and yourself with the most positive veterinary experience possible. Come to Gananoque, visit Thousand Islands Veterinary Services, take a tour of their newly renovated hospital, meet their warm and knowledgeable staff, and then book an appointment! Dr. Stevenson is well known as an industry leader in his knowledge of Lyme disease and the ticks that are a problem facing pets in the Kingston, Gananoque and Brockville areas. He has been asked to speak at the biggest veterinary conferences in North America and has done a lot of traveling doing so. He also does webinars for other Veterinarians quite often about the threat of ticks, Lyme Disease and other diseases that ticks can carry, as well as treatment of these diseases and prevention of ticks. Thousand Islands Veterinary Services offers a number of resources that enable you to learn about how to provide the best care to your pets. Please feel free to browse this site, particularly the informational articles. 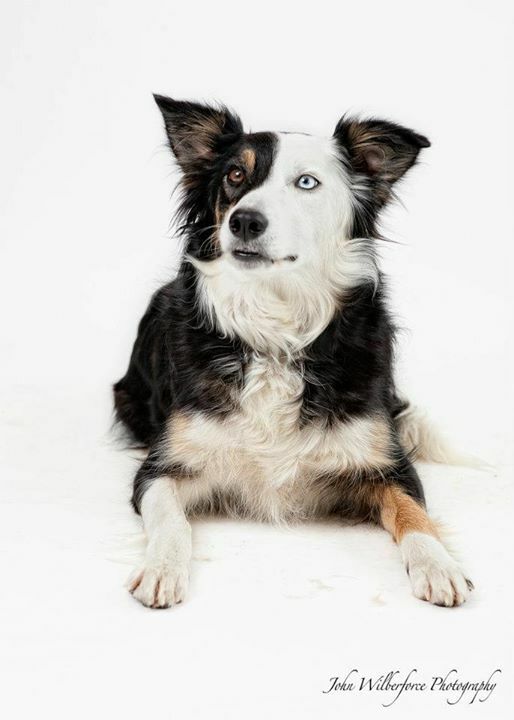 The best veterinary care focuses on disease prevention, so becoming knowledgeable about preventative health care is essential to the ongoing success of your family pets’ health. If you have any questions, call 613-382-2900 or email and they will promptly get back to you. 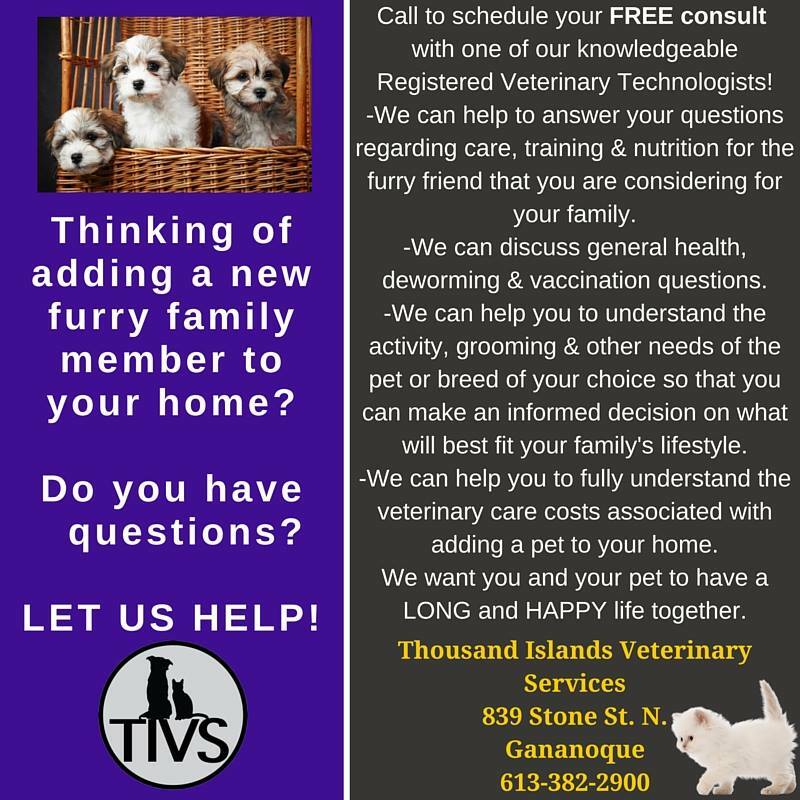 Thousand Islands Veterinary Services is very easy to get to whether you live in Gananoque, around the block in nearby Kingston or Brockville or any of the communities between -- you can find directions on the Contact Us page! At Thousand Islands Veterinary Services, we treat your pets like the valued family members they are. If you are considering adding a new furry member to your family and you would like some advice, call us to schedule a FREE appointment with one of our well trained Registered Veterinary Technologists. They can discuss nutrition, training, health needs and costs throughout your puppy or kitten's first year and beyond, how to choose a breed that's right for your lifestyle, and what you will want to ask your breeder. *30 minute appointments give you more time to ask the Vet any questions that you may have, as well lessening the chance of wait times! Ask us how to qualify for our Spay/Neuter Loyalty Discount Program! "I would like to thank 1000 Island Vet Services for the excellent service we have received when we bring our animals to your clinic. They take the time with our animals and show their care and explain everything to us. Everyone is so friendly which means so much, not only to us, but to our animals too. Great idea of now having evening appointments.